A domestic scene that gains in personality by virtue of the huge expressive value of a unique object that cannot go unnoticed. The Tree coat stand is made of coloured polyethylene; thanks to its resistance to atmospheric agents, it can also be used outdoors. It is made of matt polyethylene in white, anthracite grey, dove grey, orange, green, red, yellow, bronze or in glossy lacquered polyethylene in white, black, gold, blue, silver or purple. 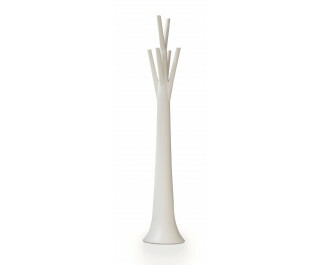 It is also available in the version fitted with a light (Tree Light), which is only available in white.